Cartridge yields approximately 860 pages. Newly designed cartridge for printing speeds. Higher yield/higher volume cartridge for frequent printing. Advanced inkjet cartridge technology ensures reliable results. 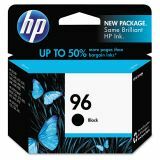 HP 96, (C8767WN) Black Original Ink Cartridge - HP 96 inkjet print cartridge provides fast, laser-quality black text and graphics. This cartridge is ideal for high-volume document printing and produces great results. It works together with the HP 95 or HP 97 tri-color inkjet print cartridges. All combinations will provide excellent results, or switch between these different products to get the best results. Cartridge is compatible with Hewlett-Packard Deskjet 5740, 5740xi, 5940, 5940xi, 6520, 6520xi, 6540, 6540dt, 6540xi, 6620, 6620xi, 6830v, 6840, 6840dt, 6840xi, 6940, 6940dt, 6980, 6980dt, 6988, 6988dt, 9800, 9800d; Officejet 7210, 7210v, 7210xi, 7310, 7310xi, 7410, 7410xi; Photosmart 2610, 2610v, 2610xi, 2710, 2710xi, 8049, 8050, 8150, 8150v, 8150xi, B8350, 8049, 8450, 8450xi and 8750. Cartridge yields approximately 860 pages.